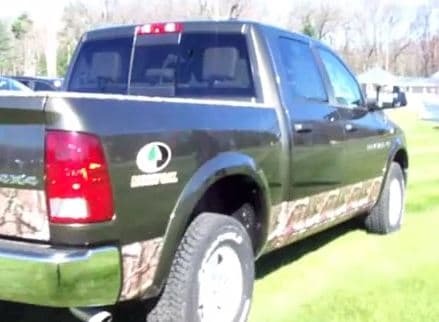 The 2014 Mossy Oak edition Ram 1500 pickup truck targets the outdoor enthusiast demographic. It is the ideal truck for hunters, fishermen and campers. The Mossy Oak’s sale price starts at $39,985 with a destination charge of $1,195. The Mossy Oak was not available in 2013 so outdoorsmen are eagerly anticipating the 2014 model. It is referred to as the “Mossy Oak” edition because of its camouflage paint. Mossy Oak is the name of a business that produces camouflage gear. The company has teamed up with Ram to make this special pickup truck. Camouflage paint is applied to the bottoms of the truck’s body and the upper lining of the cargo bed. The paint is also on the interior center stack and inside door paneling. The seating headrests are embroidered with Mossy Oak emblems. Large Mossy Oak logos can also be applied to the seat backs for an additional fee. Ram claims that Ram 1500 owners are extraordinarily active in the outdoors: 44 percent fish, 42 percent are campers, 30 percent hunt and 27 percent take to the water on boats. So, it makes sense for Ram to issue a camouflaged truck with extra storage space. New to the 2014 Mossy Oak pickup is the option to add a RamBox storage system that lets drivers transport significant amounts of outdoor gear like hunting rifles, camping tents and fishing rods. The actual storage system is composed of bedside lockable bins paired with both the 5.7 and 6.4 bed lengths. Exterior colors include Prairie Pearl, Black and Black Gold Pearl. Each can be paired with a Frost Beige or a Canyon Brown interior. The truck has cloth seats. New Katzkin leather is available in an Espresso Tuscany color. The Mossy Oak was created in the image of the Ram Outdoorsman 4×4 Crew Cab which comes with standard tow hooks and large skid plates. Side cladding is offered as an additional feature. The vehicle’s engine is likely to be available in three variations: a Pentastar V-6 with 3.6 liters, a V-6 3.0 liter EcoDiesel and a V-8 Hemi with 5.7 liters.